You will need to tap into your willpower if you want to lose weight and stay diabetes and cancer free. You need to create a different way to initiate and complete food intake to begin forming new patterns about your eating behavior. Each action you perform in your life, including thinking about eating, requires the participation of thousands of nerve cells in the brain. When you start any action, those cells are already set to interpret signals in the way they have been programmed to do in your past. 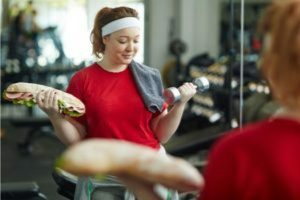 Changing your eating behavior, such as why you eat, what you eat, and more importantly how you eat, requires reprogramming nerve cells involved in the act. In other words, you must relearn the meaning of eating. You may not have much control over the occurrence of sight, sound, smell, and random thought-related cues that trigger your desire to eat, especially in places beyond your own environment. But you can moderate the effect of these cues by changing the processing that happens in your brain after these sensory impulses are received. For this, your brain has to decide consciously to override your old conditioned response. You must be able to tell yourself that the smell or sight of food does not mean you must eat it. You need willpower to resist eating when you’re not hungry and only eat when you are. To generate the willpower, you need to practice control over your impulse to eat. It is easier if you are already behaving in a disciplined way in other fields in your life. Most everyone has willpower in something in their life they can tap into. If you get to your job every morning on time, you likely have willpower that you can apply to your eating behavior. If you clean your house every Saturday without fail, you have willpower. If you take a shower everyday, you have willpower. Your thoughts are the manifestation of your will. Thoughts can be the results of your will to act or they can direct the will to form. It requires effort and training to keep your focus on beneficial thoughts. The good news is that an established thought process regarding eating can be modified based on reasoning driven by two important motivations. The first is this: If you train yourself to eat better, you can avoid a lifetime of medications to lower sugar and fat levels, unwanted side effects of the medications, and the unavoidable suffering from the complications of diabetes. The second is the realization that you will feel and look better while enjoying life far more by maintaining your authentic weight. Watch this video where I discuss the subject of giving up our favorite foods. Today, most people accept grains as if they are a required part of our daily diet. Generations of people have grown up with grains and cannot imagine eating a meal without bread, potatoes, rice, or corn. Although statistics prove that the more grains people eat, the higher the incidence of diabetes, most people (and doctors) have come to have a cavalier attitude about grains. This gives food manufacturers and marketers ammunition to entice us to consume more and more grain-based foods. In our globalized world, it is easy to find grain products like these everywhere: bagels, baguettes, breadsticks, buns, croissants, pretzels, and rolls; challah, chapatti, focaccia, injera, lavash, naan, paratha, roti, pita, pizza, and tortilla; bhatura, frybread, puri, and sopaipilla; biscuits, cakes, crackers, cupcakes, doughnuts, muffins, and pastries; mantou, pot stickers, dumplings, noodles, and other pastas; crepes, pancakes, pies, and other food products prepared with grain flours using ethnic cuisines and regional flavors. These all sound so good, don’t they? But eating them puts you at risk of high blood sugar and eventually diabetes. The above statements where taken from my book Diabetes The Real Cause & The Right Cure and are relevant for anyone who wants to build better eating habits and fight disease. 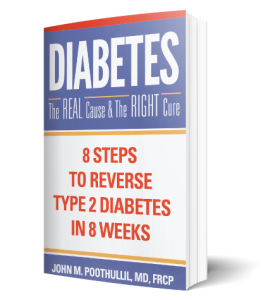 PreviousPrevious post:Wishing You A Happy & Healthy Holiday from Dr. JohnNextNext post:Does It Matter to You if Insulin Resistance is Real or Not?